Pear Stairs is one of the UK’s major suppliers of high quality and affordable stair parts. 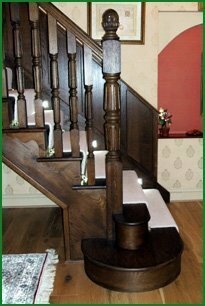 We are here to provide the people of Somerset with a range of beautifully crafted stair parts that include handrails, spindles, newel posts, newel caps, stringers, risers, treads, balustrades, wall brackets and handrail end caps. 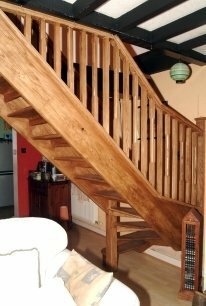 Pear Stairs' on-line shop will provide you with more information on the wide range of our stair parts available in Somerset. So, if you are looking to provide your existing staircase with a new lease of life, or simply add to your new stairway, then Pear Stairs can help make this happen. At Pear Stairs, we know that the staircase is at the centre of your home, and it can be the first thing visitors see. The design of your stairway can set the tone, so it is key that your staircase is perceived as stylish, unique and of high quality. We believe in offering the people of Somerset the highest quality service and stair parts. Whether you are renovating, replacing or upgrading your stairway, we have a workforce of experts that are dedicated to helping and pointing you in the right direction. With our customer service, unbeatable prices and excellent delivery service, you will soon be on your way to that dream staircase you have always wanted. The city of Bath in Somerset is home to a vast wealth of Roman and Georgian architectural structures. In the 18th Century, Bath became the centre of fashionable life in England. This was down to the architectural developments of buildings including Lansdown Crescent, the Royal Crescent, Old Orchard Street Theatre, The Circus and Pulteney Bridge. So why not let Pear Stairs help you create your own fashionable life? People of Somerset, do not hesitate, visit our online shop or call us now and we will provide your home with an architectural design that you will be proud of.